A man has been arrested on suspicion of murder over the disappearance of a woman who police said has not been "seen or heard from... for weeks". 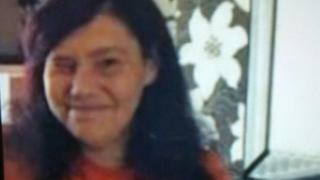 Susan Waring, 45, was last seen at a doctor's surgery on James Street West in Darwen, Lancashire, on 16 January. Det Ch Insp Geoff Hurst said she was "an active Facebook user but has not logged on since the end of January". Lancashire Police said the man, 46, was being held as searches took place in the Blackburn Road area of the town. A force spokesman added that reported sightings of Ms Waring in Dumbarton, Scotland, had been investigated and found not to be her. Det Ch Insp Hurst said no-one had "seen or heard from Susan for weeks, which is very unusual", adding: "She is often in touch with her sister." Appealing for information and witnesses who may have seen her in the days leading to the last sighting of her, he said she was about 5ft 5ins (1.65m) tall and had "smiley face tattoos" on her legs.